This guide provides search strategies and recommended resources for research in English 110 with Prof. Melissa Menendez. credible websites or information gathered from such websites. 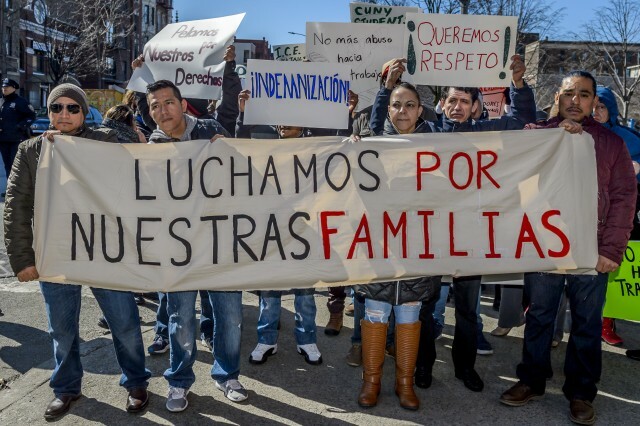 Image: "Members of Brandworkers call for an emergency solidarity march in Long Island City, Queens on March 22, 2017, in solidarity with immigrant workers at Tom Cat Bakery fighting ICE after being told by owners that ICE has given them a certain timeline to provide their employees worker status or be fired." From The American Prospect.